Royal Jelly is a natural source of many nutrients. 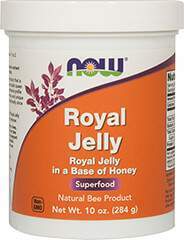 Royal Jelly is the only food for the Queen Bee, and it enables her to outlive worker bees thirty fold! The Queen Bee is also very fertile, laying up to 2,000 eggs each day throughout her life. Freeze-dried Royal Jelly is naturally produced in dry powder form and is especially suitable for two piece capsules.